Posted on October 9, 2009 by Shana N.
* Enters my fangirl!!! *Squee* Last Friday night am artsy area of town (Riverside’s 5 points area) held a block party that they call First Fridays (held the 1st Friday of each month) and as a special treat one of the boutiques Edge City (where I’ve bought my quirky sunglasses and sparkley hair pins since I was 13) had a special guest. 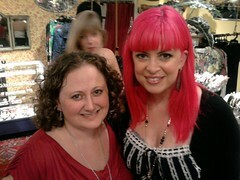 Tarina Tarintino was there to promote her new collection. I got to sneak in at the last minute thanks to the owner’s knowing me and allowing me to break the rules! You had to have spent a certain amount prior to 5pm that day in order to get in to meet her and get her look book for free. I got a look book and a photo with her. Let me tell you how kind and genorous she is. She was signing books out in the street at 10pm hungry and ready to get off her feet but was so genuinely sweet and floored by the crowd she drew….seriously people came all the way from Tampa to meet her. She was gracious to everyone and loved the stores and the people in the area. I need to post a scan of one of the pictures from the look book because it’s fabulous! * A few weeks ago I got a new tattoo. It’s my first color and also the first highly visible tattoo I have gotten as it’s about 6 inches above my wrist. 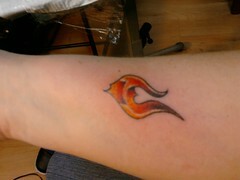 It has a heart hidden in it and stands for me and my husband as we are both fire signs. At the end of the month we will celebrate 9 years of marriage. He is my flame. It felt good to get something that I feel so strong about. * Did you feel the full moon energy Sunday night/ Monday morning? 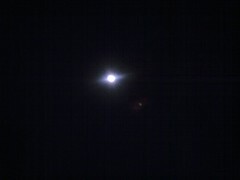 It looked beautiful and earlier in the night I wish I had snapped pictures with the clouds surrounding it! It looked magical and created a wonderful night for me and my husband. Some Lady Daisey for you…I love her positive energy and lovely voice! We are seeing her & Batsauce tonight and I can’t wait! Her site claims her music is like Sunshine for your soul….I can’t agree enough honey! Welcome back to the states! *Florence and the Machines *Revamping of an old bar…Birdie’s is going to be great! *Underbelly *Looking forward to some jamming Heavenly Noise live and back from Germany *old movies that I can watch a million and one times *new headphones for my ipod, no more static! *new music to movie soundtracks – such great full mixes *bookclub books that pull me in *Dexter and Vampire Diaries *beers bought by friends that I haven’t seen in a while *an empty house and a loving husband *new miniture pots of makeup…Sephora I am your slave *Butterflies floating past my window as I type this out!! !